The University of Alabama may become known as Running Back U. In 2009, Mark Ingram won the Heisman Trophy after rushing for 1,658 yards. In 2010, he missed two games but still led the team in rushing with 875 yards and became a first round draft pick of the New Orleans Saints. Sophomore running back Trent Richardson split time with Ingram in 2010 and also rushed for 700 yards. In 2011, Richardson took over as the lead back and rushed for 1,679 yards and became a first round draft pick of the Cleveland Browns. Sophomore running back Eddie Lacy shared time with Richardson in 2011 and became the lead back in 2012 and rushed for 1,322 yards. Is he the next first round draft pick to come from Alabama? It’s hard to say. Right now, he is the top running back on most draft boards, but that could change. Lacy did not participate in the Senior Bowl or the NFL Combine due to a hamstring injury. He also did not work out at Alabama’s pro day in March. Lacy had his own pro day at Alabama last Thursday and he had mixed results. Lacy played most of last year in the 240 lb. range, but dropped 10 lbs. in order to run faster at the workout. As a result, he ran a 4.57 40 which seemed to be faster than he looked on tape. Most scouts were concerned with is lack of stamina during the workout and he did not seem to be in good physical shape. He winded easily and was not able to do everything that NFL scouts wanted to see him do. You would think that with the extra time, Lacy would have been in very good shape, but it’s also possible that the recovery from the hamstring injury kept him from doing everything he normally would have done. The conditioning issue could be a red flag for NFL teams and it could possibly cause him to fall into the second round. Lacy is a big, powerful running back that runs angry. He is lighter on his feet than you would think. Lacy’s go-to move is a spin move that allows him to spin off of a tackler and get yardage after contact. Few tacklers are able to take him down one-on-one and Lacy always seems to surge forward after taking the initial hit. Lacy is not afraid to lower his shoulder and make contact with the defender. He has decent speed and has a good burst through the hole. I’m not sure that he will have the speed to turn the corner at the pro level, but he is an absolute beast between the tackles. Lacy is also a decent outlet receiver. The Crimson Tide had the best offensive line in the country last year, so Lacy was seldom hit in the backfield. I think that zone running teams will like him because he has good vision and is a one cut runner. There has been a running back taken in the first round of the NFL draft every year since 1963. This may be the year that string is broken. St. Louis has two picks, one at #16 and one at #22. They need a wide receiver, so if they get a receiver with the 16th pick they might look at running back at 22. Green Bay at pick 26 is also a possibility, but the Packers hardly ever use a first rounder on running backs. If Lacy falls past the Packers, he may be looking at sliding to the second round. 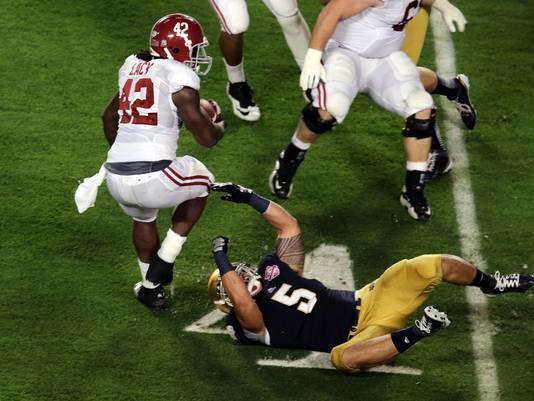 This entry was posted on April 16, 2013 by draftmaniacs in Draft profiles and tagged 2013 NFL Combine, 2013 NFL Draft, 2013 NFLDraft, Alabama football, Eddie Lacy, NFL, NFL Draft, Senior Bowl.